' ' Cinema Romantico: What's Happening in this Ocean's 8 Promo? 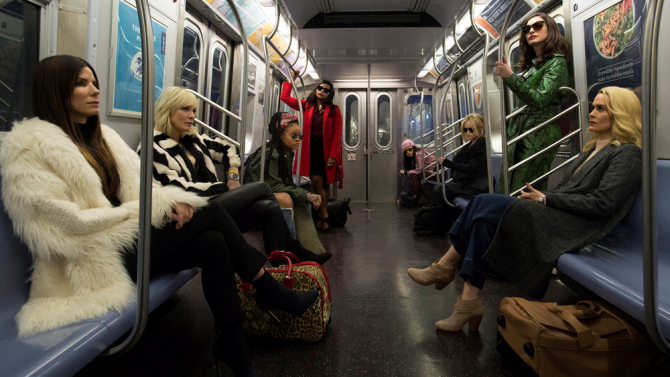 What's Happening in this Ocean's 8 Promo? Yesterday Warner Bros. Pictures and Village Roadshow Pictures released the first image of the forthcoming "Ocean's 8", a sequel of sorts to the Steven Soderbergh's "Oceans" trilogy in which several of Hollywood's most in-demand leading men portrayed a gang of debonair thieves, which was itself a spinoff to a 1960s cinematic excuse for the Rat Pack to hang out. There are legitimate debates to be had about a male being tapped to direct this all-female enterprise (I would have selected Mimi Leder - let's get her back in the game), and there are other debates to be had about whether or not women would be better to focus their voices on more original material. Still, it's pretty boss to see all those women on screen in a subway car at the same time. And seeing them all on that subway car at the same time inevitably leads to me imagining an alternate dimension where they are not all necessarily in the same movie together but merely eight women taking the subway. Sandra Bullock and Cate Blanchett are totally two Real Housewives of NYC who are currently feuding. Sandra Bullock is the Bethenny Frankel. Cate Blanchett is the Kelly Killoren Bensimon. Sarah Paulson is a businesswoman who was sitting there on her way to work when Sandra Bullock and Cate Blanchett entered the train while arguing about who first came up with the idea for a guava & oxygen flavored wine cooler. Now Sarah Paulson is just trying not to make eye contact. Helena Bonham Carter is Sandra Bullock's personal security. Anne Hathaway is transfixed by a subway ad for MCI, which she thought had been bought out long ago by Verizon. "Is MCI making a comeback?" Hathaway wonders in an internal monolouge. "Or has that ad just been up there since, like, 1987?" Rihanna is wondering what the hell is up with Hathaway's green snakeskin jacket. Awkwafina is wondering what the hell's up with the whole lot of 'em. I mean, I know Awkwafina gets the worst seat in the subway car, but I assume that's because she stepped on, heard the Real Housewives feuding and sat down as far away from them as possible. 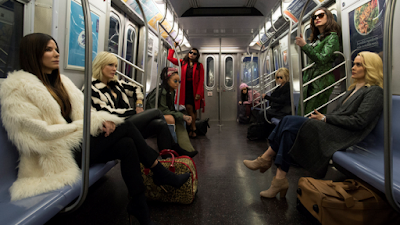 Mindy Kaling chose to stand, only to get tossed about every time the train lurches to a stop. Still, once you've chosen to stand on the subway when there are seats available, you can't sit down. That's public transit surrender, an admittance that you erred in remaining on your feet. Nope, she will continue clinging to that handrail, thank you, even though 45 seconds after this picture she falls on her face.